Now the fragrance portfolio by none other than the bootylicious ms.JLo and American Idol judge counts no less than 18 fragrances, the latest being Glowing, for the advertising campaign of which JLo shows off lots of glistening skin, encircled in an orgasmic O. Subtle, eh? 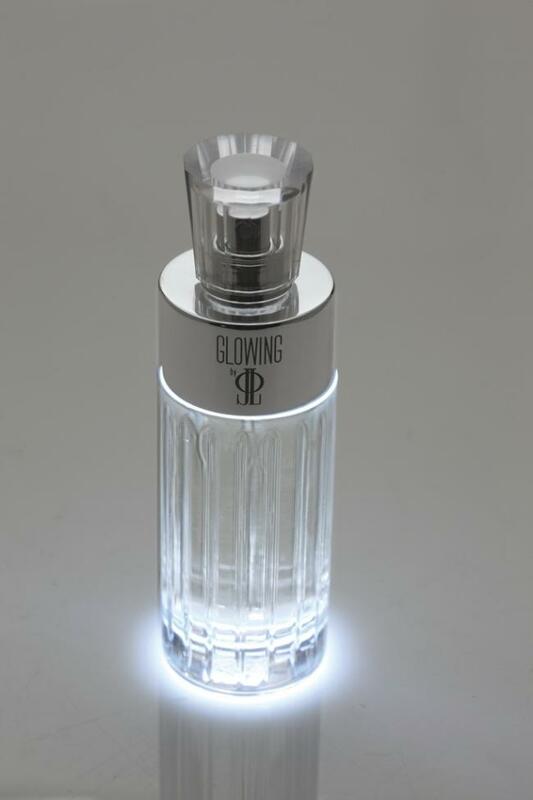 According to WWD reportage quoting Lopez "Glowing is such a clean fragrance. That's what I've always been about. I like soapy, clean smells. This is a very woodsy scent. So it's not exactly what I created 10 years ago - it's the evolution of that. At the essence, it's still natural, earthy, clean and real, but a little different side of that. It's the woodsy side of it, which I think is kind of New York-y, darker and sexier." A darker and sexier "clean". Riiiiiiight. I expect it will smell of honey and concrete (it's the first unrelated stream of consciousness thing that popped into my mind; after all the above quote isn't noted for its coherence or logic, right? It's just PST: "perfume selling talk" ). Glowing by Jennifer Lopez is a floral woody amber concocted by Jennifer with Givaudan's Calice Becker and Caroline Sabas. (I'm willing to believe JLo was somewhat involved since her first foray into perfume clearly mirrored one of her longtime favourites, China Rain.) It has top notes of bergamot, mandarin and cypress; a heart of orange flower, muguet de bois (aka lily of the valley) and cassia flower, and a drydown of sandalwood, amber, vanilla, vetiver, patchouli and cashmere musk (read: Cashmeran, a popular aromachemical with a smell between wet concrete & wood-musks). But "darker and sexier clean"? Glow wasn't half dirty either, I should say! Practically a an aldehydic soapy-musky rose with a white floral note thrown in and it made for a HUGE success 10 years ago which brought all the celebitoscent craziness upon us (it's enough for marketeers to see one experiment go well saleswise and then they copy the concept ad infinitum). Jennifer says she hadn't imagined the lasting influence: "You don't think about things like that- when you're creating, you're just in the moment. You're doing it right then for right then. You always hope that things have a lasting impression and you go into it with those types of big thoughts - 'Oh, this could be like Coco Mademoiselle or Chanel No.5!' You aim for that, but you don't really think of it when you're in the moment.'" Chanel? These people are in a world of their own. that's what I thought too. The first Glow was good and a couple of the others were nice. It starts looking like a factory conveyor belt by now. These celebrity perfumes are really on my last nerve. They all seem to smell the same, this fruity floral mess that smells half done. It makes it easy, though. Whenever you want to attract perverted fruit flies, you don't need to do anything but reach for the nearest celebrity and spritz away! My comment is not very perfume related but I'll make it anyways. I have difficulties with every photo of JLO, because I concentrate on how her legs are presented (=hidden). She's probably got the shortest legs of the whole celebrity industry. This is a perfume article and I just stare at the photo: "How did they prolong(elongate? )/hide her legs THIS time? That twisted circle or "O" makes one of her legs look very long. It would be nice if someone edited Jennifer Lopez' remarks for 1) grammar 2) unnecessary repetition. Oh I forgot, her target audience has an IQ of 50! Duh! Catch me wearing this rubbish. Its embarrassing enough reading her drivel. they're a tired concept, but apparently they still sell, so they will keep on tormenting us, it seems :? you know, I hadn't noticed but your point is well worth considering. Yeah, they do "hide" them. I bet she's not tall enough and with a pear figure the legs look even shorter than they are. it seems like she makes absolutely no sense in those quotes! Which is funny, as I would have presumed they would be carefully edited out to reflect well on the new release. Apparently people in charge are bored. She is bored too. Can't blame her, to be honest. Yes it seems boredom is all over the place, BUT-someone is churning out gallons of bad scent. Making money is not boring apparently. My feeling on the subject is she is wealthy enough w/o my nickel going into her pocket, and this goes for all celebrities. I dont care how "good" their eponymous or sponsored perfumes are, I am fed up with their blatant greed. It might be different if they had any talent in a different field, but I doubt that that is the case. How many have degrees in chemistry? Or indeed any degree? degrees aside (and this comes from someone who has a few but never saw money coming out of them LOL! ), the thing is there is no need other than to self-brand. Perfume is apparently a necessary part of self-branding these days and celebrities are products like everything else. s absolutely no reason to make them wealthier than they already are. (for instance, the amount JLo receives for American Idol is obscene, if true; if she values the talents emerging as much, she might give half her salary to a drama & singing school scholarship). hahaha! Well, it's good to have high aspirations I guess! Meh. She's probably a more interesting person than her perfumes would lead one to believe, which is sad. That photo is a Photoshop horror story and belongs on one of those web sites that catalogs wild PS deformaties. That prominent leg is about six feet long, all by itself. The one I wish would do scents is De Niro. They would be subtle and noble, because he wouldn't allow less. Idiots would bring him something stupid twice, and he would fire them, and that would go on for many rounds until someone brought him something that wasn't completely stupid. He would say, "..hnh, maybe," and send them away four more times until he had something he was willing to try on friends. That round would also produce plenty of failures, but eventually something that would be incredibly good and a classic for the ages. I imagine something simple but profound like Encre Noire, but with Italian roots. IMHO, he should skip all the Americans and go straight to Milan. The Photoshop is probably ironic and counter-intuitive given her Gilette Venus commercials where it's obvious she's no gazelle but of the Marilyn school of legs (muscled up and not particularly long/lean).